Veneers are pieces of porcelain or ceramic placed over your original teeth to create a more resilient and stronger tooth, while improving the overall appearance of it. They’re precisely and accurately measured to ensure the proper and appropriate fit with your teeth regarding both size and shade. In fact, they’ll be so perfectly matched that virtually no one will know that you’re wearing them! At Irvington Dental Group, we provide expert dental care to the East Orange, NJ area, and are dedicated to improving our patients smiles with partial dentures and veneers. Veneers offer the ideal solution for many dental conditions and are excellent alternatives to crowns. They can also be used to cover dark stains, close gaps in between teeth, make them even in length, and of course, create a beautiful and uniform smile. The same procedure that allows celebrities, TV personalities, and movie stars to enjoy seemingly perfect teeth and oral health is available to you to help dramatically and effectively improve your smile and enjoy lasting and enduring brightness. Dental veneers can also be used for restorations. For instance, when teeth become cracked, chipped, or broken, a veneer can be used to restore the tooth to its original condition and make it functional again, as long as its structure is still intact. And once the procedure is complete, your smile will not only look fantastic, but you’ll be able to eat food without any more pain or discomfort. It all starts with a first impression — of your teeth, that is. 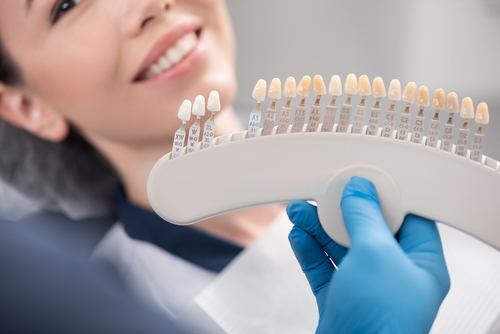 When you come in for your appointment, our dental veneer specialists will take the impression, then send the mold to a laboratory where they’ll be custom-fabricated and personalized to fit your mouth and match your tooth shade. This fabrication process typically takes a week or more to ensure proper fit and color of your new veneers. The next step involved is placing temporary veneers over your teeth. Each tooth will be prepared using a small amount of enamel. This allows the veneer to lay in line with the gum tissue. After this site preparation, your dentist will apply a removable glue and the temporary veneers to get you accustomed to wearing them while your permanent veneers are readied. While the temporary veneers are in place, it’s crucial to take special care not to damage it, so be careful when brushing and avoid eating hard foods. Once your permanent veneers are ready, we’ll contact you, and you can schedule an appointment. Your temporary veneers will be gently removed, and we’ll replace them with your brand new, customized, and perfectly-fitting veneers. We’ll place them over your teeth and make any necessary adjustments to ensure the proper fit and maximum comfort. Now you’re ready to smile and laugh again with the confidence of a restored and amazing smile! After your veneer procedure, you may experience some slight soreness for a few days, but this is entirely normal and poses no need for concern. Over this duration, over-the-counter pain medications can be taken to reduce inflammation and discomfort. A cold compress is also recommended to decrease any swelling that may occur. Being vigilant of your diet for the next few days and only eating soft foods during this recovery time is recommended to reduce the possibility of damaging your new veneers. At Irvington Dental Group, we proudly provide the residents of East Orange, NJ and the surrounding areas with expert dental care. For more information on our veneers procedure, or for our 24-hour dentist services, call us at 973-373-3456.